I have been up for a couple of hours now and the sun has yet to rise. I’m savoring the last few minutes of quiet time before my husband gets up and invites me for a walk down the beach to the local Starbucks two hotels over. The last few days before Christmas were a blur as we scrambled to cross items off our Christmas list, met friends and family for dinner and prepared for a short getaway. I will share a snapshot or two as the week progresses. We spent Christmas Day doing as little as possible and we think it’s a good plan to follow for the remainder of our vacation. In the meantime, here’s something I threw together before we left for our trip. It was a clean-out-the-fridge dish but isn’t it pretty? 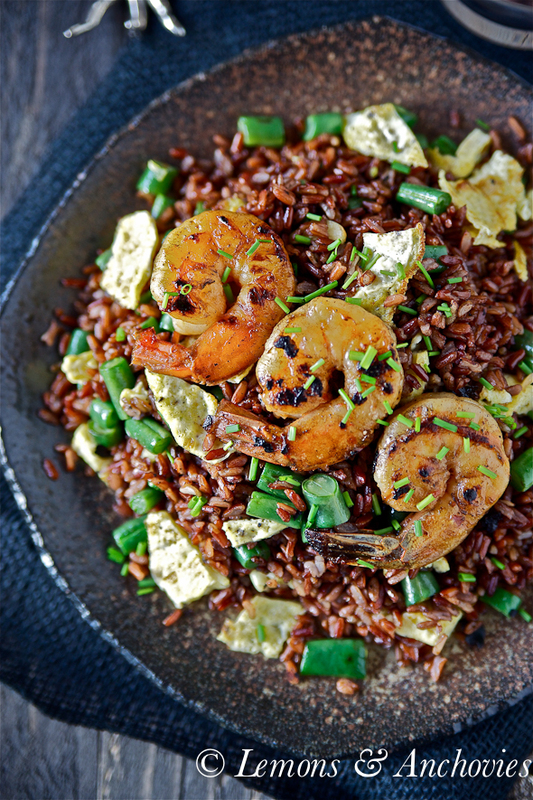 The red Jasmine rice really does a lot to liven up an easy stir-fry of eggs, green beans and prawns. This is my version of homestyle shrimp fried rice though I used prawns which I marinated to give them more depth. If you’re lucky enough to have good, fresh prawns they would need no enhancing but my frozen variety improved much by tossing them in a bit of olive oil, chili sauce and sweet soy sauce (kecap manis). Feel free to use regular white or brown rice if that’s what you have. I arranged the prawns on top just for additional visual interest but there’s no need for this either–toss your shrimp or prawns in with everything else to make it even easier. Your plate may not be as colorful without the red rice but I am certain it will be just as flavorful. I hope you all had a joy-filled and jolly Christmas!! 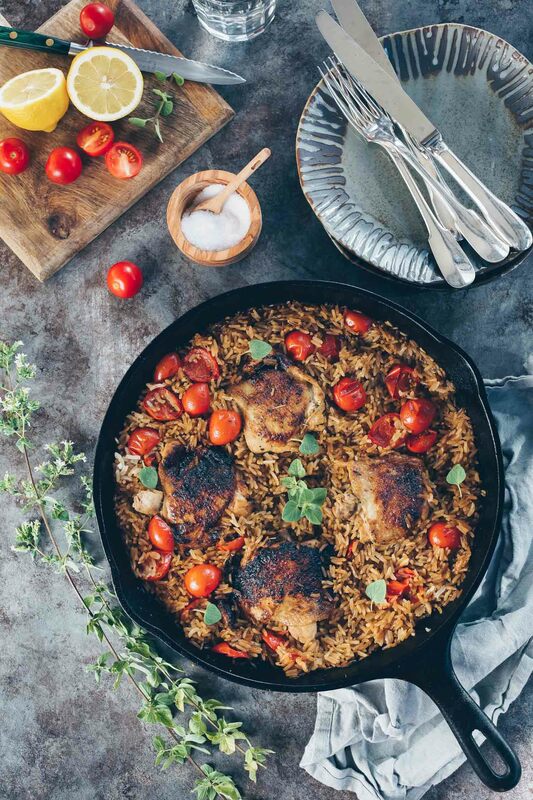 This is a simple rice dish that's pretty enough for company. To prepare the prawns, combine all the marinade ingredients in a bowl and add the prawns (or shrimp). Toss them in the marinade ingredients and marinate for at least thirty minutes. Note: If you're using large prawns like I did, you can cut them in smaller pieces if you're planning toss them in the rice and not just use them as a topper. To prepare the eggs, whisk them in a bowl with a fork. Heat up a teaspoon or two of oil in a skillet over medium-high heat. Add the eggs making sure the bottom of the pan is covered evenly. After about two minutes, flip the egg with a spatula and cook the other side for another minute. Remove from the pan and onto a cutting board and cut in squares. Set aside. Using the same skillet that you cooked the eggs in, add the marinated prawns and cook until just pink on both sides, about 2-3 minutes per side depending on the size prawns/shrimp you're using. Transfer to a bowl and set aside. Again, using the same skillet, sauté the green beans, adding another tablespoon or two of olive oil if you think your pan is too dry. Cook for about two minutes or until slightly caramelized on the edges. Add the sliced garlic and cook for another minute, until fragrant. Add the rice and turn up the heat to high. Stir-fry for a couple of minutes until the rice is heated through. Add a splash or two of soy sauce or kecap manis. Add the egg pieces and the prawns, too, if you prefer them tossed in the rice. Otherwise, turn off the heat and transfer the rice to a serving dish and top with the cooked prawns. Garnish with chopped chives before serving. I have to try that red rice! It looks delicious! The fried rice looks so good. I love the color. this looks wonderful – i’m going to try this before my mother in law leaves – she would love it! That brown Jasmine rice looks interesting.. Merry Christmas and a Happy new year to you! Absolutely gorgeous! Lovely colors and combination. Clean-the-fridge-out dish in it’s best! So pretty! PS: I LOVE this plate!!! I think sometimes we stress ourselves out on holiday trying to fit too much in. It sounds like a good plan to chill out for a bit. 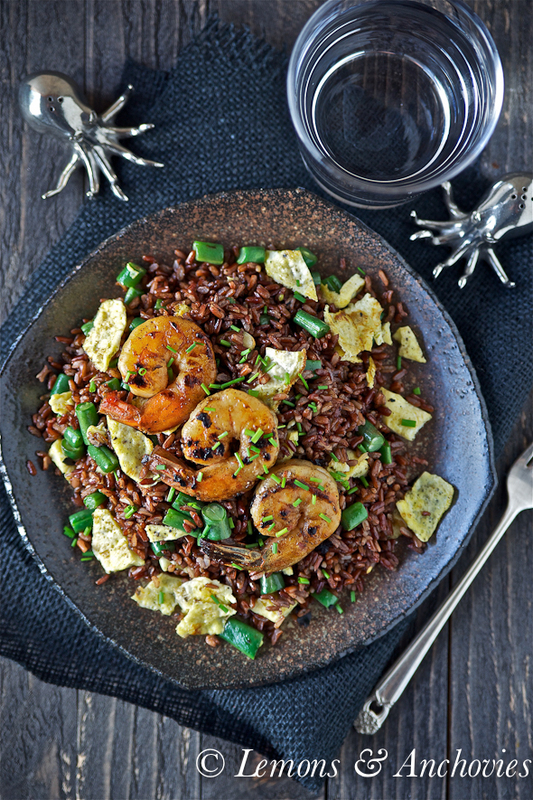 I love the red rice – it makes a pretty dish so much more exciting. Those prawns look perfect. Yum, love fried rice and the color of this one is eye popping and appealing, I would probably eat more than my fair share. This looks incredible! I love the colors almost too pretty to eat, but at the same time I want to devour it! I hope you and your husband are enjoying your trip! A relaxed holiday,is how it should be. Skipping Thanksgiving was the best decision we made LOL. If…no when I make this I will def let you know, Jean! LOVELY! Shrimp fried rice is delicious! A comforting meal on a cold winter day! This looks absolutely amazing! 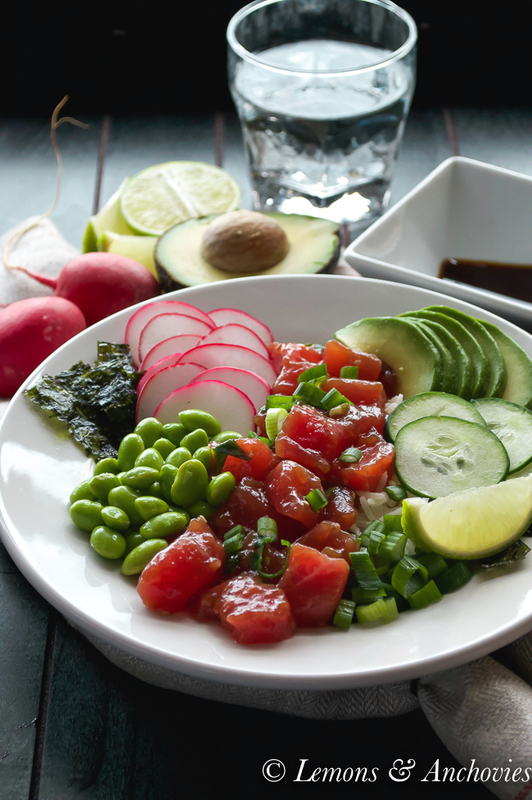 Love all the colors, that rice – yum!! I love a dish like that that is “just thrown together.” Happy New Year. Pretty, pretty, pretty – did I say pretty? – fried rice! My rice never turn out this vibrant. My clean-out-the-fridge fried rice always look like garbage – haha! I should take notes from you. As usual, your recipe is invigorating! 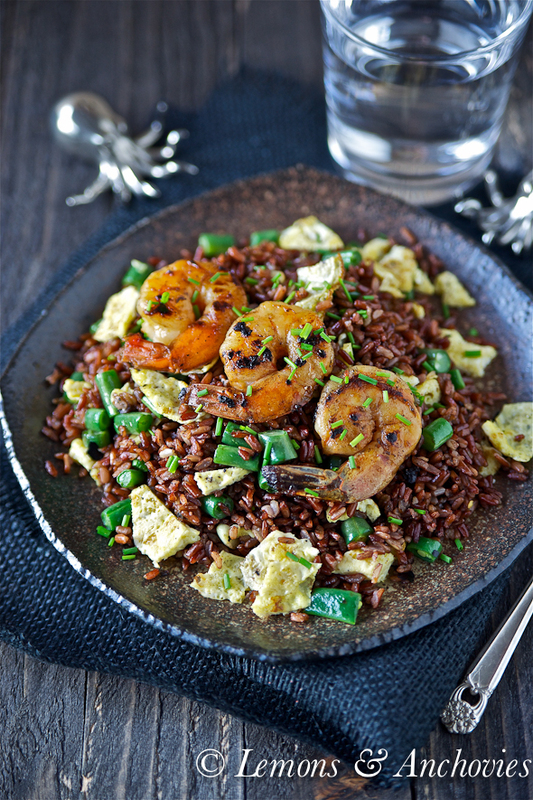 It’s been too long since I had shrimp fried rice… I want some stat! This looks so, so good! Oh, Jean!! I love this dish. My son discovered shrimp this year on our vacation, but I’ve yet to make it at home. This looks to be one dish I think he will really like. 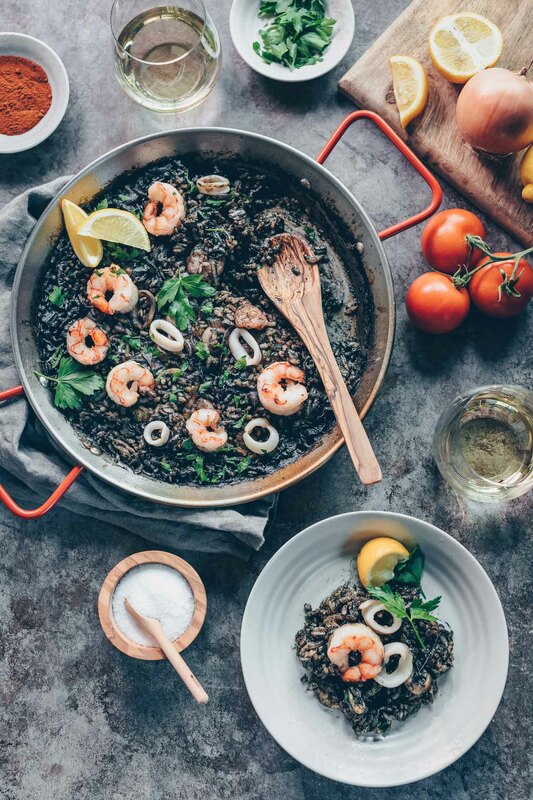 I’ve not used the red rice yet, but our local store has a black rice that I’m loving. So glad you enjoyed your vacation, I sure enjoyed your photos!